Much to the dismay of many kids (and even some parents), school is back in session. Along with the start of the school year comes an increase in road and foot traffic. The Boca Raton personal injury lawyers with the Shiner Law Group want everyone to be as safe as possible when traveling not only during the school year, but at all other times as well. Parents: practice crossing the street at crosswalks and walking your child to school. There are also several things children can do to remain safe both at the bus stop and on the bus. With respect to bus stop safety, children should get to the bus stop at least five minutes prior to the time he or she is scheduled for pick up. Also, kids should never sit on a curb or in the road while waiting for the bus — they should find a safe spot to sit away from the road. The Department of Highway Safety and Motor Vehicles advises parents and caregivers to teach their children the proper way to cross the street and board the bus. When the bus comes to a complete stop, children should wait for the driver to signal that it is okay to cross the street and/or board the bus. Additionally, when crossing the street, kids should look left, right, then left again and make certain the bus driver can see them when crossing. When on the bus, children should remain seated and keep the aisle clear of bags and/or other items that might cause harm in case of an accident. Children should also know the bus driver’s name, as well as the bus number. And finally, parents should encourage their children to avoid disruptive and/or loud behavior that might distract the driver. 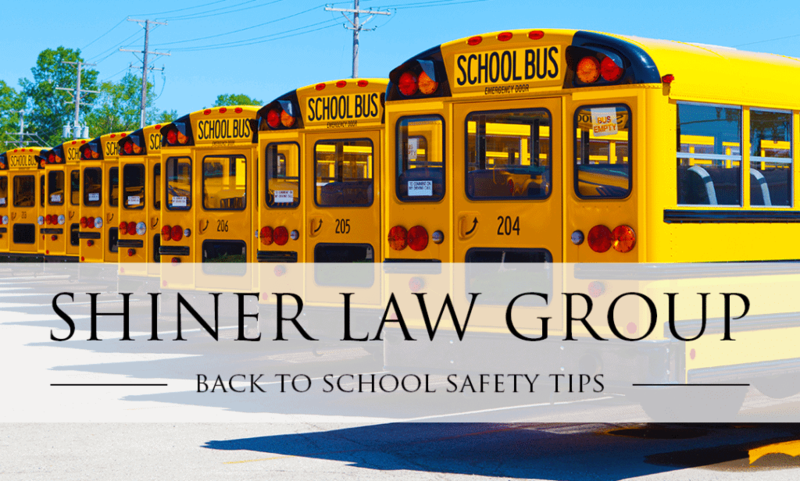 If you have additional questions or concerns about back to school safety, or if your child has been injured, contact The Shiner Law Group today for help.